Adopting Lacy has been a blessing to me and my family. She's so gentle, sweet, caring and anyone can ride her because she's so well behaved. 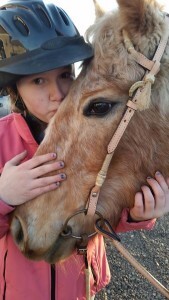 Lacy is the perfect horse for me and I know I'm the perfect girl for her! I am so thankful that we were able to give her a good home. Lacy has taught me so much about how to care for a horse and I love her so much! Thank you RCER for rescuing Lacy!